Happy Friday! Thanks for joining our first week of blogging. Each week, we’ll be bringing you a range of interesting products to drool over. This week, it’s all about getting more green into your life! 1. 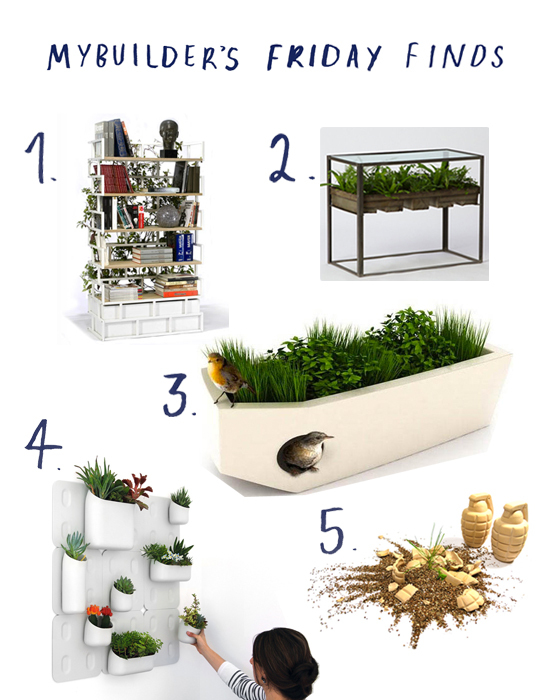 Greenbook – It’s a bookshelf and a planter all in one and a great way to squeeze some green into your home. 2. The Terrarium side table has a glass top to let you see your plants growing! 3. The Kokon Modern Pet House – for when you want to save space and keep your herb garden where your furry friend can’t get to it. 4. Urbis Planters are cool little modular magnetic planters – put them on the wall or on your fridge. 5. Flower Grenades are a nifty way to get some flowers growing in random spots – either around your garden or in the community. MyBuilder is an online marketplace for homeowners to find quality tradesmen. The blog features competitions, advice and opinion pieces about home improvement. Looking for a tradesperson?Post a job for free today!